Infineon AG has added the EVAL_5QR2270AZ_33W1, a universal 33 W, 24 V ultra-wide input voltage range power supply evaluation board. 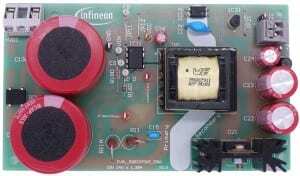 It is typically used as housekeeping power supply in professional SMPS. 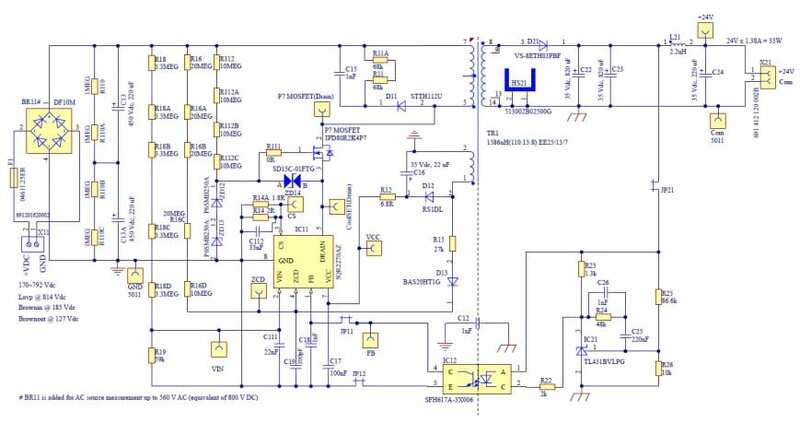 Typically driven from the bulk capacitor after any PFC stage or from the bulk after a three-phase rectifier, any dc input voltage from 190Vdc to 790Vdc may be applied to this board. Target applications include; home appliances, e-metering, smart metering, industrial motor control, and other designs benefiting from an ultra-wide 3-phase input capability. The improved digital frequency reduction with proprietary QR operation offers lower EMI and higher efficiency for a wide ac range by reducing the switching frequency difference between low- and high-line. The enhanced Active Burst Mode (ABM) power enables flexibility in standby power operation range selection and quasi-resonant (QR) operation during ABM. As a result, the system efficiency over the entire load range is significantly improved compared to a conventional free-running QR converter implemented with only maximum switching frequency limitation at light load. Protection is one of the major factors in determining whether the system is safe and robust. Therefore sufficient protection is necessary. ICE5QR2270AZ provides comprehensive protection to ensure the system is operating safely. The protections include line OV, brown-out, VCC OV and UV, over-load, output OV, over-temperature (controller junction), CS short-to-GND and VCC short-to-GND. When those faults are found, the system will go into the protection mode, until the fault is removed, when the system resumes normal operation. A list of protections and failure conditions are shown in the table below. 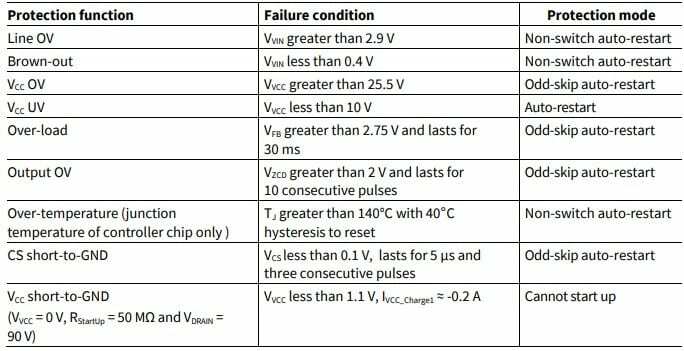 By means of the cycle-by-cycle Peak Current Limitation (PCL), the dimensions of the transformer and current rating of the secondary diode can both be optimized. Thus, a cost-effective solution can easily be achieved.